Waterproof 3-layer fabric, a zipper covered on the backside and an all welded design: The main compartment is 100% waterproof. You don't need any rain cover and there is no inner bag you additionally need to open. Elastic ROKstraps™ ensure, that your tankbag stays in place also on the toughest tracks. 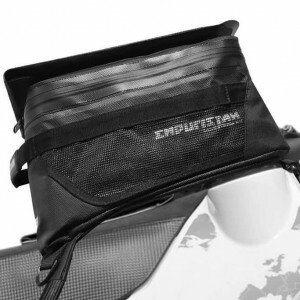 Quick release buckles allow easy refueling and fastening. Is there anything more annoying than a broken zipper? For this reason we only use YKK's toughest coil zipper. Also for buckles, straps and materials we accept no compromise: Only high quality materials guarantee a long and useful life. Soft, unreinforced design, no "nutter-effect"
Join the Most Wanted newsletter!